We have a small and “secret”pier on the mainland, only a short boat trip away. At first glance, this looks kust like any other lonely pier reaching out in the ocean from the sandy shore. But put your head under water, this is critter paradice no.1. And if we are really lucky we might see elephants walking along the shore. 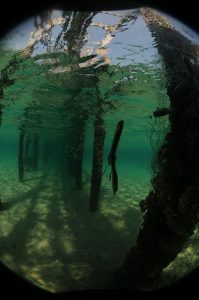 This pier is not often in use, and it is situated a bit up the coast away from people, so many critters find their little haven here, around the protective pillars and in the fine sand. When you put your critter eyes on, and stick your head in the sand, you can find octopuses hiding in shells and on the sand. Seahorses on,behind and around almost every pole. Colorful and yet unidentified nudibranchs and flatworms crawl around. Carry crabs wandering around with planks, leafs and other fancy decorations. 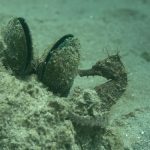 Juvenile batfish and sweetlips are wobbling around in between debris. Milk Spottet puffers swim up to you and wonder what you are doing. 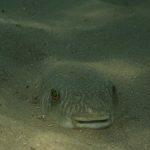 Toad fish and rays hide in the sand. This dive is all about gliding slowly back and forth, maintaining perfect buoyancy control, peeking around and under things and be amazed of what suddenly pops up. And at the right time of year this is THE cuttle fish mating area. 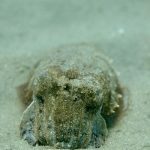 If you are lucky you can see cuttle fish doing their mating dance, laying their eggs and just hanging out.